acceleration The time rate of change of velocity of a reference point during an earthquake. Commonly expressed in percentage of gravity. (g, equal to 980 cm/s2 ). accelerogram The record from an accelerograph showing ground acceleration as a function of time. accelerograph A compact, rugged instrument that records the signal from an accelerometer. accelerometer An instrument used to measure acceleration. Used to measure the response of the ground or a structure to shaking in an earthquake. acceptable risk The probability of social or economic consequences due to a hazard that is a realistic basis for determining design requirements or taking certain social or economic actions. aftershock Smaller earthquakes following the largest or main earthquake in a series in a restricted area. alluvium Loosely compacted sand, gravel, and silt deposited by streams in relatively recent geologic time. The most common surface material in the valleys of western Utah. amplification (seismic) The increase in surface ground motion at certain frequencies in unconsolidated sediments relative to the motion in solid rock. Occurs in the valleys of western Utah. amplitude (wave) Maximum deviation from normal of any wave-like disturbance. aseismic Almost free of earthquakes. asthenosphere The soft and probably partly molten layer of the earth below the lithosphere. Distinguished by low seismic-wave velocities and high seismic wave attenuation . attenuation The decrease in seismic signal amplitude caused by spreading of the wave and absorption and scattering of seismic energy by the materials of the earth as a wave propagates from a source. b value A measure of the relative frequency of the occurrence of earthquakes of different sizes. basement Igneous and metamorphic rocks underlying the sedimentary rocks of a region and extending to the base of the crust. In Utah these rocks are mostly of Precambrian age. Basin and Range province The area of the western United States, including most of western Utah, that is characterized by alternating basins and ranges. basin and range structure The geologic structure that is characteristic of theBasin and Range province with the basins and ranges bounded on one or both sides by normal faults . Movement on the faults, sometimes referred to as basin and range faults, accounts for much of the topographic relief between the basins and the ranges. bedrock Solid rock that is exposed or underlies softer rock, sediments, or soil. Commonly used by engineering geologists to refer to any consolidated rock but often used in Utah to refer to rocks underlying the sedimentary rocks that were deposited in Cenozoic basins and valleys. body wave Seismic wave propagated in the interior of the earth. P and S waves are examples. body-wave magnitude See magnitude, body wave. brittle behavior Failure (sudden loss of strength) at some critical stress either by breaking along a new fracture or, most commonly, by frictional sliding on an already existing fracture. caldera A large, roughly circular volcanic depression whose diameter is many times greater than that of its vent or vents. capable fault See fault, capable . compressional wave See P wave. core The central part of the earth, beginning at a depth of about 2900 km, probably consisting of iron-nickel alloy; it is divisible into an outer core that may be liquid and an inner core about 1300 km in radius that may be solid. creep (fault) Slow movement along a fault that does not produce earthquakes. critical facilities Structures whose functioning during an emergency is essential or whose failure would endanger many lives. May include: structures such as nuclear power plants or large dams whose failure could be catastrophic; major communication, utility, and transportation systems; involuntary or high occupancy buildings such as prisons or schools; emergency facilities such as hospitals, police and fire stations, and emergency-response facilities. crust (of the earth) The outermost major layer of the earth; in Utah, ranging from 35 to 45 km thick and with a compressional seismic wave velocity (in rock) between 3.0 and 7.5 km/s. debris flow A moving mass of rock fragments, soil, and mud, more than half ofthe particles being larger than sand size. density The mass per unit volume of a material. design acceleration The anticipated ground acceleration at a site used for earthquake-resistance design of a structure. design earthquake The largest earthquake that has a high enough probability of occurring at a site that it is appropriate to design a structure to withstand it. dilatancy (rock) The increase in volume of rock due to a change in strain. dip The angle of a fault or other planar geologic feature relative to horizontal. dip-slip fault See fault, dip-slip. displacement The difference between the initial position of a reference point and a later position. In geology it is the permanent offset of a reference point across a fault. ductile deformation Behavior in which rocks, at a critical stress, do not rupture but instead become permanently deformed by flowing. duration (earthquake) The length of time the ground motion at a site shows certain characteristics in an earthquake. earthquake The shaking or vibrating of the ground caused by the sudden release of energy stored in rock beneath the earth’s surface. earthquake hazard Any physical phenomenon associated with an earthquake that may produce adverse effects on human activities. earthquake hazard reduction A broad term used for the process of lessening the impact of earthquakes on society. earthquake loss The actual or anticipated damage to life and property caused by earthquakes. earthquake risk The social and economic consequences of anticipated earthquakes expressed in economic loss or casualties. Risk may be expressedas the probability that these will equal or exceed specified values in an area during a specified interval of time. earthquake source The origination point of earthquake energy release. elastic deformation A nonpermanent deformation in which a solid returns to its original size and shape after an external deforming force is removed. elastic rebound The release of strain energy by the abrupt movement of a fault with a resultant earthquake. epicenter The point on the surface of the earth directly above the point where the first rupture and first earthquake motion occur. exceedance probability The probability that a specified level of ground motion or social or economic impact in an area will be exceeded in a specified time. exposure (earthquake) The potential casualties or economic loss to all or to specific subsets of population or structures from one or more earthquakes in an area. fault A fracture in the earth along which the two sides have been displaced relative to each other. fault, active A fault along which displacement has occurred in recent geologic time or along which earthquake foci are located. Active faults are assumed to be capable of producing earthquakes. fault, capable An active fault or fault zone that has the potential to cause surface displacement during the lifetime of a project under consideration. fault, dip-slip A fault with the major component of relative displacement along the direction of dip of the fault. fault, left-lateral A strike-slip fault on which displacement of the block opposite the observer is to the left. fault, normal A sloping faulting on which the block above the fault has moved downward relative to the block below. 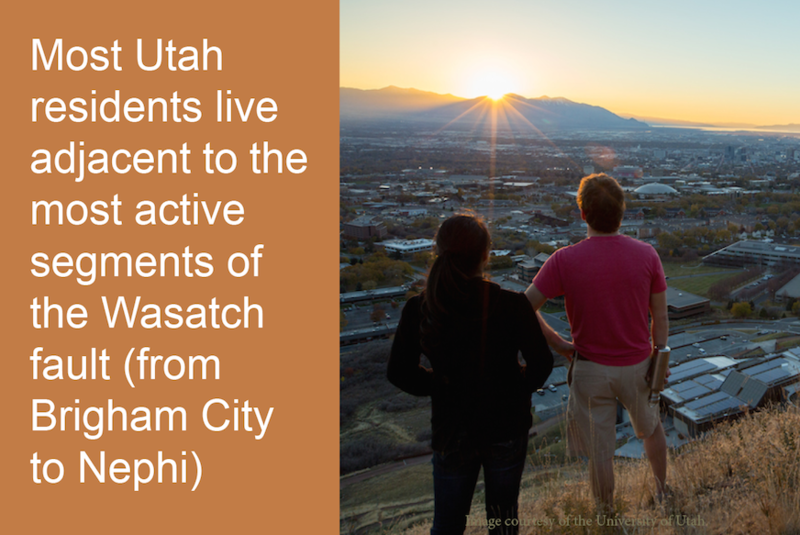 The Wasatch fault in Utah is an example of a normal fault. fault, oblique-slip A fault with both strike-slip and dip-slip movement. fault, right-lateral A strike-slip fault on which displacement of the block opposite the observer is to the right. fault segment A discrete section of a fault, separated by recognizable boundaries that tends to rupture independently. fault, strike-slip A fault on which the movement is parallel to the fault’s strike. fault, thrust or overthrust A dip-slip fault in which the upper block moves over the lower block. The dip of some thrust faults is low and the displacement may be tens of miles. Old thrust faults are common in western Utah. fault, transform A strike-slip fault at the end of tectonic plates. fault plane A plane that approximates the rupture surface of a fault. fault-plane solution The use of seismic waves radiating from an earthquake and recorded at several stations to determine the attitude of a fault producing an earthquake and the direction of slip. fault scarp Steplike linear landform caused by the geologically recent offset of the land surface by a fault. fault trace The intersection of a fault with the land surface. Commonly plotted on geologic maps to represent the location of the fault. fire The most common secondary hazard resulting from an earthquake. first motion The direction of ground motion as the P-wave arrives at a seismometer. Used to compute fault-plane solutions. floating earthquake Earthquakes in regions of moderate to high seismicity that cannot be correlated with known geologic structures and thus are assumed to be likely to occur at any location in the region. focal depth The depth below the surface of the hypocenter or focus of an earthquake. focus The point within the earth where earthquake rupture begins. foreshocks Smaller earthquakes preceding the main earthquake in a series. free field Ground motion measurements that are not influenced by constructed structures. frequency The number of cycles occurring in a unit time. fundamental period The longest period of ground motion for which a structure shows a maximum response. geodesy The study of the shape and size of the earth. geodimeter An instrument used to measure distance between points on the surface of the earth. geologic hazard A geologic feature or process that has the potential to have an adverse effect on people or structures. geomorphology The study of the origin and character of landforms. geotechnical Related to the use of scientific methods and engineering principles to acquire, interpret and apply knowledge of earth materials to solving engineering problems. gouge Rock crushed in a fault zone. graben A block of the earth’s crust, usually elongated, that has subsided relative to adjacent rocks along bounding faults. Many of the valleys of western Utah are grabens. gravity anomaly A feature in the gravity field of the earth caused by the distribution of mass in the earth. ground motion and ground response General terms referring to the quantitative or qualitative motion of the earth’s surface produced by earthquakes or explosions. group velocity The velocity with which most of the energy in a wave train travels. Hertz (Hz) A unit of frequency, equal to the number of cycles per second. See frequency . Holocene The past 10,000 years of geologic time. horst An elongated block of the earth’s crust uplifted relative to surrounding rocks along bounding faults. Many of the ranges in western Utah are horsts. hot spot A volcanic center, 100 to 200 km across and persistent for at least a few tens of millions of years, that is thought to be the surface expression of a rising plume of hot mantle material. hypocenter The point within the earth where earthquake rupture begins; the focus of an earthquake. intensity (earthquake) A subjective numerical index describing the severity of ground shaking in an earthquake in terms of the effect on objects and humans. A version of the Modified Mercalli intensity scale is on page __. interplate earthquake An earthquake that occurs on the boundary between two tectonic plates. intraplate earthquake An earthquake that occurs within the interior a tectonic plate. isoseismal A contour on a map bounding areas of equal intensity for a particular earthquake. isostasy A condition of hydrostatic equilibrium with the rigid part of the earth’s crust floating on a denser and more mobile sublayer. Thus extensive areas of high topography are underlain by “roots” of relatively low density and the adding or removal of material at the surface causes vertical adjustments to maintain equilibrium. Isostasy is demonstrated in Utah by the subsidence and rebound of the Lake Bonneville basin in response to the adding and removal of the water load of Lake Bonneville. landslide The perceptible downward sliding or falling of masses of rock or soil; can include earthflows, debris flows, rock avalanches, and rock falls. lateral spreads Landslides that form on gentle slopes as the result of liquefactionof a near-surface layer from ground shaking in an earthquake. left-lateral fault See fault, left-lateral. lineament An extensive linear topographic feature or geophysical anomaly which usually reflects an underlying structure. liquefaction The process by which water-saturated unconsolidated sediments subjected to shaking in an earthquake temporarily lose strength and behave like a fluid. The lower areas of many of western Utah’s valley are susceptible to liquefaction. lithosphere The solid outer crust of the earth including the crust and upper mantle. longitudinal wave See P wave. loss estimation and loss reduction Estimation and reduction of loss or damage that will result from earthquakes. Love wave A type of seismic surface having only horizontal motion transverse to the direction of propagation. magnetic anomaly A feature in the magnetic field produced by the distribution of magnetized material in the earth. magnitude (earthquake) A number that characterizes the size of an earthquake by measuring the motions recorded by a seismograph and correcting for the distance to the epicenter of the earthquake. magnitude, body-wave [mb] A measure of the of the magnitude of an earthquake determined from P waves. magnitude, local [ML] A measure of the magnitude of a local earthquake originally defined by Charles Richter using the maximum amplitude recorded by horizontal-component seismographs. magnitude, moment [M] The magnitude of an earthquake determined from seismic moment. magnitude, surface-wave [MS] The magnitude of an earthquake determined from surface waves. mantle (of the earth) That part of the earth between the crust and the core. In Utah the mantle lies __ to __ km below the surface. maximum credible earthquake The largest earthquake, usually expressed in magnitude, judged to be possible in an area. microzonation Delineation on a local scale of areas having different potentials for the hazardous effects of earthquakes. Mohorovicic (moho) discontinuity The boundary between the crust and upper mantle usually identified by an increase in the velocity of propagation of seismic waves. moment (earthquake) A measure of the energy released in an earthquake determined by strength of the fault and the area and amount of slip. natural frequency The frequency at which an elastic system vibrates when set in motion by a single pulse. normal fault See fault, normal. oblique-slip fault See fault, oblique-slip. outcrop The area where a particular rock body reaches the surface. overburden Unconsolidated materials overlying rock. P wave A seismic wave that involves particle motion in the direction of propagation. It is the fastest traveling wave generated by an earthquake and therefore the first to arrive at any point. paleoseismology The study of geologically recent earthquakes. period (wave) The time interval required for one cycle of a wave. phase A stage in a periodic motion measured with respect to a reference and expressed in angular measure. physiographic The character and distribution of landforms. plate (tectonic) A large unit of the earth’s lithosphere that moves relative to other plates and the interior of the earth. plate tectonics The theory of movement and interaction of large plates of the earth’s crust that explains earthquakes, volcanos and other geologic processes as consequences of the movement. Rayleigh wave A seismic surface wave involving elliptical motion in a vertical plane oriented in the direction of propagation of the wave. recurrence interval The average time between specific events at a particular site. reflection (seismic wave) Seismic energy that has been returned (reflected) from an interface of materials of different elastic properties. refraction (seismic wave) Seismic energy that has been deflected by passing from one material to another with different elastic properties. resonance An increase in the amplitude of vibration of a body when the frequency of shaking is close to the natural frequency of the body. response spectrum The peak response of a series of simple harmonic oscillators of different natural frequencies when subjected to a particular earthquake ground motion. return period See recurrence interval. right-lateral fault See fault, right-lateral. rigidity The angular shear strain produced from applying shear stress to a body. See shear modulus. risk (seismic) See earthquake risk. risk evaluation, risk reduction, and risk management All relate to exposure of life and property to earthquake hazards. rock avalanche A large mass of rock, sliding or flowing very rapidly under the force of gravity. rock fall Large block(s) of rock falling under the force of gravity. rupture velocity The speed at which a fault rupture propagates along a fault. S wave A seismic body wave involving shear motion transverse to the direction of propagation of the wave. sand boil Sand and water ejected from the ground as the result of liquefaction at shallow depths in an earthquake. scarp A steep slope formed by the displacement of the ground surface by movement of a fault or by other geologic process such as a landslide. See fault scarp. seiche Oscillation of the surface of a closed body of water when the surface is disturbed by wind or an earthquake. seismic hazard See earthquake hazard. seismic hazard analysis An orderly approach to quantifying the extent to which a site or a region is exposed to earthquake hazards. seismic moment See moment (earthquake). seismic risk See earthquake risk. seismic wave An elastic wave generated in the earth by an earthquake or explosion. seismic zonation Geographic delineation of areas having different potential for hazardous effects of earthquakes. seismic zone An area within which the seismic-design requirements are constant. seismograph An instrument for amplifying and recording the motions of the earth caused by seismic waves. seismology The study of earthquakes, earthquake sources, and the propagation of seismic waves. seismometer The sensor that detects the seismic wave energy and transform it into an electric voltage. seismotectonic zone or province A geographic area characterized by similar geology and earthquake characteristics. shear modulus The ratio of shear stress to shear strain of a material during simple shear. shear wave See S wave. site A locality at which the actual or potential effects of an earthquake are evaluated. slip (fault) The relative displacement of one of two points on opposite sides of a fault. slip rate The average velocity of displacement of points on opposite sides of a fault. snow avalanche A large mass of snow, falling, sliding, or flowing very rapidly under the force of gravity. soil A natural occurring layer of minerals and organic material capable of supporting vegetation. In engineering, all unconsolidated material above bedrock. soil profile The vertical arrangement of soil horizons down to the parent material. stick-slip Jerky frictional fault slip in which the opposing blocks of rock, held by friction, episodically and suddenly slide.strain (elastic) The percentage change in the length, shape, or volume of a body subjected to deformation. stress (elastic) Force per unit area acting on a surface within a body. stress drop The difference between the stress across a fault before and after an earthquake. strike The bearing relative to north of a line defined by the intersection of a planar geologic feature, such as a fault, and a horizontal surface. strike-slip fault See fault, strike-slip. strong motion (ground) Ground motion of sufficient amplitude to be of interest in evaluating the damage caused by earthquakes or nuclear explosions. structural features Features in rocks produced by movement after the rocks were formed. subduction A plate tectonic process of one plate descending into the earth below another. surface faulting (surface fault rupture) Displacement of the ground or sea floor surface by a fault movement. Surface faulting is thought to occur in Utah only in earthquakes of magnitude 6.3 or larger. surface waves Seismic waves that propagate along the surface of the earth (Love and Rayleigh waves). swarm (earthquake) A series of related earthquakes concentrated in location and time with no one earthquake of outstanding size. Earthquake swarms are common in Utah. tectonic earthquake Earthquakes resulting from the release of strain by deformation of the earth. tectonic province A region characterized by uniform geologic structures. tectonics A branch of geology dealing with structure and deformation of the earth’s crust. thrust fault See fault, thrust. transform fault See fault, transform. travel-time or time-distance curve A graph of time versus distance for the arrival of seismic waves at a series of stations. tsunami A large ocean wave usually cause by movement in the sea floor related to an earthquake or volcanic eruption. velocity (seismic) The time rate of displacement of a reference point in an earthquake or the speed with which a particular seismic wave propagates in a rock. velocity structure A generalized model of the crust consisting of units of different seismic velocity. viscoelastic A type of deformation in which a material behaves like an elastic solid when it is rapidly strained on time scales of seconds to hours, but deforms viscously by plastic flow over long periods of geologic time. volcanic earthquakes An earthquake related to volcanic activity. water table The upper surface of an unconfined body of ground water. waveform (seismic) A plot of the displacement produced by a seismic wave as a function of time. wavelength The distance between two adjacent crests or troughs of a wave. wavelet A seismic pulse usually consisting of 1½ or 2 cycles. Bates, Robert L., and Julia A. Jackson, eds., American Geological Institute. Dictionary of Geological Terms , 3d ed. New York: Doubleday, 1984. Bolt, Bruce A., University of California, Berkeley. Earthquakes. New York: W.H. Freeman and Company, 1988. Shah, Haresh, “Glossary of Terms for Probabilistic Seismic-Risk and Hazard Analysis.” Earthquake Spectra (Earthquake Engineering Research Institute) 1, no. 1 (November 1984): 33-40. The Cambridge Encyclopedia of Earth Sciences . Smith, David. G., ed-in-chief. New York: Crown Publishers, Inc./Cambridge University Press, 1981. Ziony, J.I., ed. Evaluating Earthquake Hazards in the Los Angeles Region­An Earth-Science Perspective . U.S. Geological Survey Professional Paper 1360, 1985.